What do you call a salty fish? A photon checks into a hotel. The manager at the front desks asks if he will be needing any help with luggage. The photon replies "no thank you I'm traveling light." I don't trust atoms... they make up everything. How does Iron Man freshen up his apartment? Q: Why did the bear dissolve in water? A chemistry lab is just like a party. Some drop acid, others drop the base. These jokes are sodium funny! Did you hear oxygen and magnesium are together? I want to tell another chemistry joke but all the good ones arsenic. Did you know that you can cool yourself down to -273.15 degrees Celsius and still be 0K? Two chemists go into a bar. The first one Jim says "I think I'll have an H2O." The second one Bob says "I think I'll have an H2O too"... and then Bob died. Q: How often do you joke about the elements? Chemists are just one lab accident away from being a super villain. Polar bear: Help! Help! I'm dissolving! Polar bear: That's easy for you to say...You're not polar! "That's easy for you to say, you are not polar....."
Proton: "I think I lost an electron"
What kind of fish is made up of only 2 sodium atoms? Q: What is the name of the molecule bunny-O-bunny? I told a joke to a guy named Helium to get him to share his electrons but he didn't react. What's Uranium's favorite genre of music? This relationship is as flexible as a sigma bond. Q:Are my jokes too basic for you? A: Why is there no reaction? What TV show do Cesium and Iodine love watching together? Q: Did you know protons have a mass? A: I didn't even know they were catholic! A: Because it was polar! What is your LiFe composed of? Did you hear oxygen went on a date with potassium? A: It went OK.
H I J K L M N O.
I made a chemistry joke. It got no reaction. How does a photon avoid paying United economy bag fees? It always is traveling light. A neutron walks into a bar and orders a drink. When the neutron asks how much the drink was, the bartender replies "For you, no charge". You're a 10? On the pH scale, maybe. 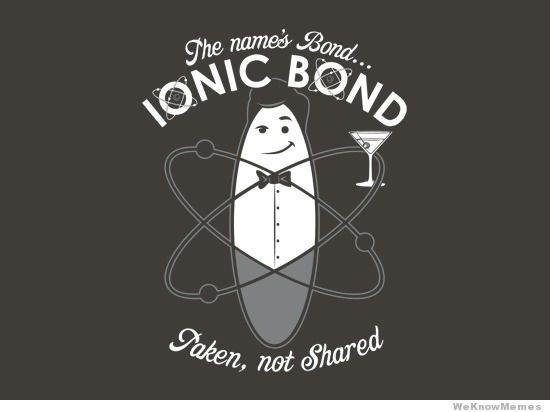 When it comes to chemistry puns I'm in my element.